Las Vegas – Nine months after the deadliest mass shooting in modern U.S. history, MGM Resorts International has filed a lawsuit against more than 1,000 victims, in an attempt to avoid liability. MGM’s famous Mandalay Bay Hotel was the site where suspect Stephen Paddock is accused of destroying the windows in his room on the 32nd floor, and then unleashing a hail of bullets on the crowd below at the nearby Route 91 Harvest festival—which was held at a venue that is also owned by MGM. The move marks a new low for the company, which has faced massive scrutiny for both its response to the shooting and the failure of its employees to spot the obvious warning signs in the days before the massacre. The Nevada Supreme Court gave hope to many of the survivors when it overturned a case that could have served as a precedent to protect MGM Resorts from legal liability. The case was from 2010, and it occurred at another MGM property, the New York-New York Hotel. Carey Humphries and Lorenzo Rocha were at the casino when they were attacked by a man in an assault that was so brutal, it fractured Humphries’s skull. While courts initially ruled that the New York-New York had no way to foresee the attack, the Nevada Supreme Court ruled that the attack actually could have been predicted because there had been other violent incidents at the casino—therefore the hotel and MGM could be held liable. The company cites a 2002 federal act that extends liability protection to any company that uses “anti-terrorism” technology or services that can “help prevent and respond to mass violence.” In this case, the company argues, the security vendor MGM hired for Route 91, Contemporary Services Corp., was protected from liability because its services had been certified by the Department of Homeland Security for “protecting against and responding to acts of mass injury and destruction.” The lawsuits argue that this protection also extends to MGM, since MGM hired the security company. While the lawsuit does not request financial compensation from the victims, it does ask for a judge to protect MGM from any future lawsuits related to the shooting. 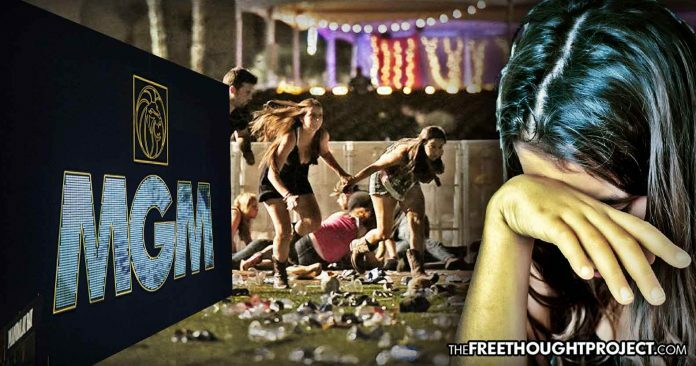 As The Free Thought Project has reported, MGM Resorts International is responsible for publicly changing its narrative on the events of the shooting multiple times. One of the most crucial shifts occurred in January when MGM claimed that the hotel staff at Mandalay Bay had at least 10 interactions with Paddock in the days before the shooting. While MGM’s lawsuit against the victims serves as yet another filing in a case that puts the company on the stand, it could give the public insight into the questionable actions of the MGM employees before, during and after the October 1, 2017, shooting.